OMG, Tiffany…This was such a moving post. Food for much thought and feeling. Thank goodness you and yours are safe. Thanks, Kit. I’m feeling very lucky and blessed. Yes yes yes. 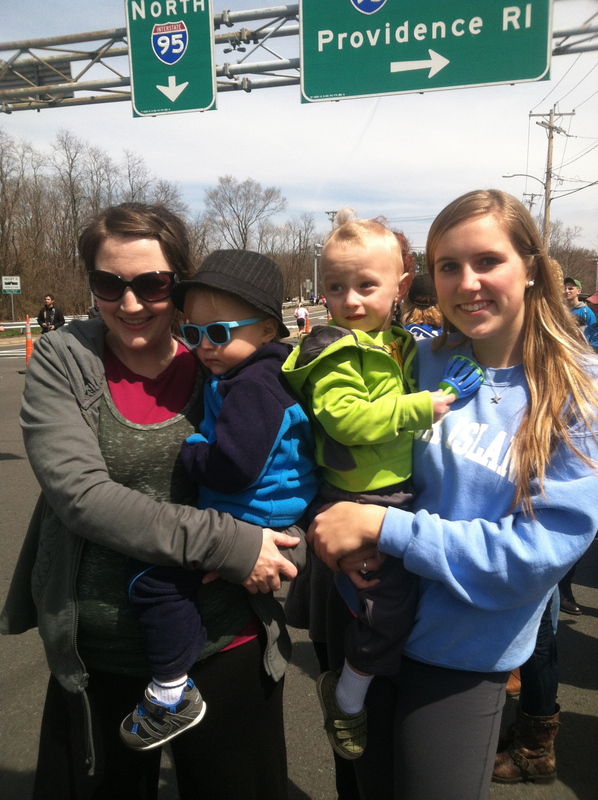 Cheering at the marathon is my favorite annual activity, and you’ve summed up exactly why. Let’s throw love even harder in 2014. Annie, it’s always been my favorite too! Those 2014 runners better get ready, because we’re going to shower them with love and support! This post brought tears to my eyes. I’m so relieved that you, your twins, and your dad are safe. This made me cry at the coffee shop. You are a wonderful mama, and a wonderful daughter, and a wonderful human. I am so lucky to have you as a friend. So grateful you and the boys and your dad are safe. Awww, Jess! No crying in coffee shops. 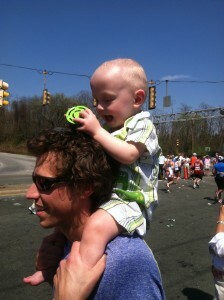 The twins were talking about the race today: “I see’d Cuppie run! He run fast! Race so fun!” It made me so glad to hear that they have only happy associations with the Marathon. What a touching post! Happy to hear that you’re all okay. This is so beautifully written. What a touching story. Thanks, Gina. I’m feeling very blessed that all of my loved ones are safe, and grieving along with the rest of MA for those who are not. I’m sorry our paths didn’t cross this trip — consider the Schmidtlets hugged from you and pass along my XO’s to yours. Thanks, Tiffany. Thanks for this. You just made me sob my eyes out. I’m never going to understand why people want to hurt humans, people they don’t know, INNOCENTS. It’s horrifying how people can be that cruel, especially with the lives of children there. There are NO words. 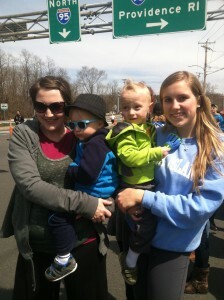 Like my friend said–they’re tainting the tradition of the marathon. It’s heartbreaking. I think it’s the fact that we would NEVER be able to commit such acts of evil that makes it so hard to process why other people would. It doesn’t make sense, Nikki, and it never will. And no matter what evidence comes to light or what the suspect says, we won’t understand it. Glad you are all ok! I didn’t realize that you had such a history with the Boston Marathon. A powerful, humbling thought that no one is safe anywhere, but that we can’t let that direct our futures. We can only live fully and love deeply. Thanks for posting! Awesome story Tiff. It captures the sentiments that I have heard from dozens of people. It takes a hero to face danger, be scared but fight that fear and go back. If we do that, we win, the bad guys lose and the Boston Marathon and community grows stronger. 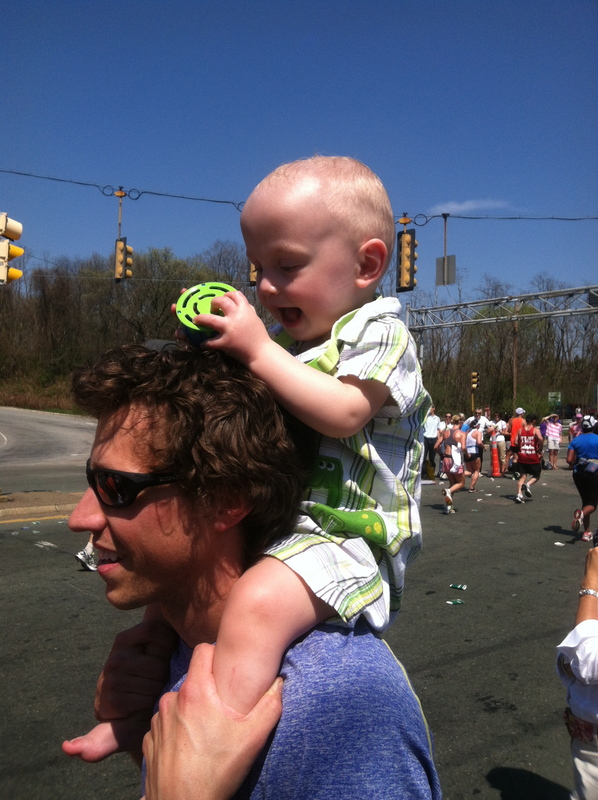 I’ll be there with you next year – out there running with Nick. Beautifully written, you articulated what so many of us feel but aren’t able to put into words! We will be there next year yelling even louder for your Dad! I cannot begin to tell you how many people I’ve forwarded this to, including a number of people I work with in our Boston office. Thank you. Perfectly put. The “Buts” can be haunting. You are right though that because we love the city, the marathon, the people running, everything it encompasses and touches, we will not let it fade. Love you! I am touched by your words. I thought of your Dad (my mom’s cousin) when this awful event unfolded. I was even more worried when I tracked his time and knew he had to have been close. I am so glad you and your family are okay. And I am even more proud of you all for wanting to return next year! You are proof that we ARE Boston strong! Tiffany – I went to high school with your Dad. I’ve been in Maryland for 37 years. I finally found out today that your Dad is safe, although I figured that was, indeed, the case. I did not know for sure. I followed the link in his posting to yours. You have touched my heart. Thank you so much for putting your observations online. Just saw the link posted on Help in the Nick of Time FB page. What a beautiful, truly moving post. 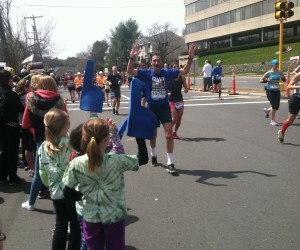 Glad for your wonderful Boston Marathon memories! I worked with your dad at Chipcom a long time ago. We ran together many times at work. I ran Boston 3x before moving to CA. I understand what you mean about being there with your twins. My son, AJ, was 2 1/2 and we were in Boston on the weekend before 9/11, booked on a flight to SF on 9/11. I changed the flight the night before to 9/12 to stay in Boston and spend one more day with my dad. When we finally were able to fly out and I was at Logan with AJ, it was the same anxious feelings. All our love to you and all of your family! 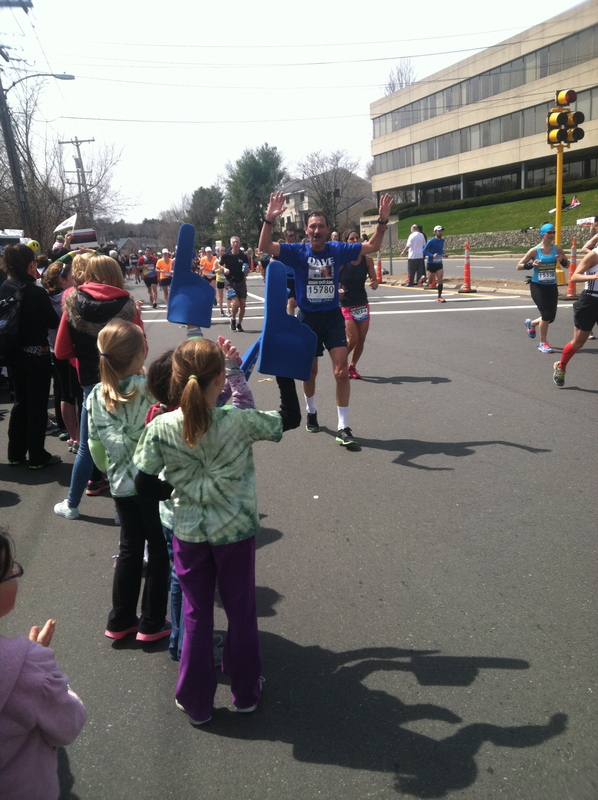 I’ve been rooting Dave on for many years and wish him an awesome Boston 2014! Coming up soon!